I can't say enough about how amazing our wedding was at The Commons 1954 on 10/12/18. The staff at The Commons made the whole planning process painless! We specifically worked closely with Kristi and Maura, but the whole staff was amazing! Mora felt like an extensions of my bridesmaids throughout the whole process - she took the time to get to know us and had so many wonderful ideas. On the day of the wedding she was absolutely perfect ensuring everything went smoothly. We literally did not have to think about anything other than enjoying ourselves and celebrating. Maura was absolutely perfect in coordinating everything that needed to happen - to pumping the bridal party up before walking in to the reception, to bustling my dress, and even packing us up some wedding cake to enjoy after the wedding. She truly felt like a good friend, and she honestly wanted us to truly enjoy our day. To anyone thinking about having their wedding at The Commons - you will not regret it! Our day was absolutely perfect, I am tearing up now just thinking about it! I could not have dreamt of a more perfect day for my wedding day. Not only is the Commons a beautiful venue that does not need a ton of decorations but also they run a tight ship helping any bride or groom out throughout the planning process answering any question you can think of to every detail being thought through and executed perfectly on the day of. Our coordinator, Maura, kept telling us that she did not want us to worry about anything except to have fun and enjoy our wedding day and this was beautifully executed. Also, the food was absolutely amazing! It was so delicious that we have gotten so many compliments from our guest for the next few weeks following the wedding... even the ones considered foodies were raving about how delicious it tasted. You would think by choosing a venue where they really know what they are doing that you would just be another "wedding" that is not the case at all. Everyone that works at the venue, especially Maura, really makes you feel like you are the only wedding that month, with so much attention to detail and such warm greetings. I could not rave about The Commons enough and it was the perfect choice. Point blank: Our wedding was like a fantasy. It was an actual dream come true. It was everything we could have hoped for and SO MUCH MORE-- and we have The Commons 1854 to thank for that. I do not exaggerate when I say that our wedding was absolutely perfect. P-e-r-f-e-c-t with a capital P, and I mean that from the bottom of my soul. Not only are the Martino's a lovely family to work with, they are also backed by an amazing crew of chefs, coordinators, and caterers, all dedicated to making your big day, truly, the BEST day. We could not have asked for a better venue, a better family, and a better team to bring our dream to life. 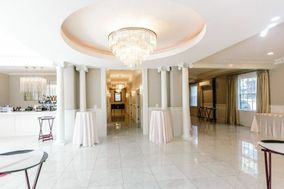 From the stunning outdoor garden, to the sleek and polished cocktail room, to the grand ballroom, golden, sparkling, and beautiful-- The Commons 1854 is a stunning venue. But the people behind it are what truly make this venue special. Kristi was the most attentive coordinator! She was constantly providing for us, checking up on us, helping us keep things moving, assisting us when we needed it, making sure we were eating and staying sane amongst all the glorious chaos. Kristi was a fabulous hostess and really went above and beyond to make sure my husband, our bridal party, our family, and our guests were taken care of. Truly, the entire family is so incredibly kind, caring, attentive, and flexible. I really don't have the words to do my feelings about the Martino family justice. We love you guys so much. Furthermore, sometimes, the venue itself can be outstanding, but the food might be so-so. I know i've personally been to a few weddings were the food was downright unimpressive. NOT with the Martinos! This family prides themselves on their cooking, traveling to Europe to learn from world class chefs. Let me tell you, it really shows in the food! Not only do you get an incredible venue, you get 5 star chefs catering your day just the way you like it! Eveything was so darn delicious. From our cocktail hour appetizers (coconut shrimp, mango brie tartlets, grilled cheese and tomato soup shooters-- need I say more?! ), to the main course (prime rib, roasted turkey, seasoned vegetables, greek pasta salad, quinoa salad, pasta three ways), to late night snacks (pizza and french fries, duh! ), to our very own gelato sundae bar featuring six flavors--- our guests were blown away by the delectable quality of the food. I find myself craving the food we had that night even today! Truthfully, I could go on and on about how much I love this venue, the family behind it, and the time and attention they pour into every single couple they encounter. Don't just take my word for it-- book the Commons 1854 for your big day. I promise the Martino family will pull out all the stops to blow you away and make your day truly memorable, and magical. I don't even know where to begin. Gianna you were absolutely amazing and there for me every step of the way, especially on the wedding day, when I started to feel anxious. Besides the wonderful staff, including Kristi, everything was superb. The food is THE BEST. the hall is breathtaking, photos do not do it justice. I highly recommend the commons, you will not regret it! Thank you for everything!! 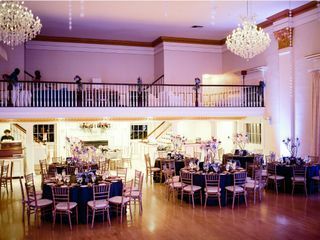 We threw the wedding of the century at The Commons 1854 in Topsfield, MA! 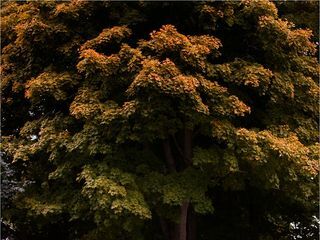 We first fell in love with the Commons because of the amazing event planners, the beautiful, New England, and classic space, and a lot of recommendations. We could not have been more thrilled with the result. My husband and I met as English Majors in college and wanted to have a literary themed wedding. The Commons was super accommodating to our theme- they let us use book titles instead of table numbers and gave us plenty of ideas. Our wedding party was huge (17 people) and we were able to fit everyone under the pergola in the garden for the ceremony. The food was amazing. The passed hors derves were incredible and there was plenty for everyone (178 guests). Our meals were cooked perfectly! We had 140 filet mignons and each was cooked absolutely perfectly. We also had a cake made from their outside partner vendor that was both lemon raspberry and cannoli flavored. They even made a separate batman cake for my husband that came out amazing! Finally, our wedding planner, Maura Galligan was absolutely the best wedding planner ever. She thought of everything and was able to make all of our ideas (both crazy and seemingly impossible) work flawlessly with her incredible organization, attention to detail, ,and eerie ability to be in multiple places at once. I felt so at ease with her running things. We never knew anything went wrong if it did, and we were able to eat, and dance all night on our wedding day because of her incredible effort to make all our wedding dreams come true! The staff at The Commons is amazing! We worked with Kristi and Gianna at various times through the planning process of my daughter's wedding and then more closely with Gianna as the wedding day neared. Gianna was on site the day and night of the wedding, and we were thrilled that she was our wedding coordinator. Everything went like clockwork, just as she promised. Gianna and Kristi are the consummate professionals. They are the most organized and reliable people you could ever hope to work with. Any time we emailed, we received a reply back within an hour or two. They truly created a no-stress wedding experience. My daughter, son-in-law, and I were smitten with The Commons the moment we saw it. From the garden ceremony space to the gorgeous marble floors of the cocktail area to the balconied ballroom, the venue is extraordinarily beautiful and immaculately maintained. Our guests raved about the food, the service, and the ambiance. In addition, the acoustics are fabulous. Thanks, Gianna for helping us to create what our guests called the Best Wedding Ever! Our experience with The Commons 1854 was excellent, and we are so happy we chose to celebrate our wedding at their venue. 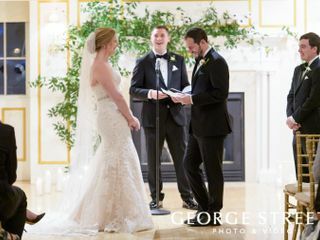 The staff was incredibly thoughtful, attentive, and friendly, which made the planning process and our actual wedding day smooth and enjoyable. Gianna and Kristi were both incredibly responsive and helpful throughout everything. The garden was a perfect backdrop for our ceremony, and guests raved about the beauty of the cocktail space and reception rooms as well. The food was excellent and the gelato/cannolis are not to be missed! The Commons 1854 is a gorgeous venue with one of a kind with service and staff to match. You will be happy you chose them for your special day! Where do we begin! The Commons is where the best night of our lives took place! Working on such an important event with Gianna and Kristi up until the big day was smooth and as easy as wedding planning could possibly be. It can be stressful at times I thought as most brides do, although their advice and quick responses to any questions made it a lot less worrisome. We visited 3 venues before visiting The Commons (my sister got married at The Commons in 2014 and I didn’t want to “copy her”) and we couldn’t resist choosing this one out of the others. It was an easy decision after comparing all other options and what you get for your money. We will forever be grateful that we chose you guys for the best day/night of our lives! The Commons 1854 is such a gorgeous venue! Both my husband and I fell in love with it from the moment we first saw it! My wedding day was absolutely perfect and everything I dreamed of would be! My guests are still talking about how great the food was! The entire staff at the commons was extremely helpful and super responsive from start to end. Gianna was such an amazing wedding coordinator! She was extremely helpful and responsive to any questions/concerns I had throughout the wedding planning process. We are so happy we chose The Commons and want to Thank the entire staff for making our wedding day so special! Everyone at the Commons is super helpful and accommodating. They were great to work with and made our wedding day stress free and perfect. We had a fantastic experience at the commons. 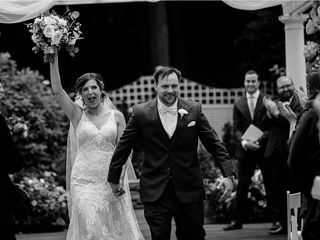 From the beginning we felt comfortable and extremely confident in their ability to execute a flawless wedding, and that’s exactly what they did. We first met with Kristi, who owns this family run business, and she was fantastic helping us to understand our options and how to make the best use of our budget. Once we decided on the venue we worked with Gianna to iron out the details and execute on game day. She was wonderful and even helped us coordinate the shipment of 18 cakes from Pittsburgh that had special meaning for us. This was at no extra cost even though it required their time and a few days of refrigerated storage! Just one of the many examples of the high level of service that is part of their philosophy and simply built in to how they operate. On the day of, the venue looked gorgeous and things went better than we ever could have imagined; the staff was excellent (several of our guests commented on how great), food (made by venue) was perfect, and Gianna was always nearby asking what we needed or predicting a need we were to busy to even think about! We really couldn’t be happier. I could go on forever but I think the above should capture about all you need to know to at least go check the place and people out for yourself! Overall, I can't say enough good things about The Commons 1854. My daughter's wedding ran so smoothly. Gianna, our wedding coordinator, was AMAZING!!! Somehow, she manages to be everywhere at once. She's professional, kind...just unbelievable at her job. The food.....OUTSTANDING! People are still talking about it. There wasn't a single item that I felt could have been prepared better or tasted better. It's obviously not the cheapest place to hold your wedding, but it's worth every penny. I would 100% recommend The Commons 1854 for any event. Our wedding was held on December 30, 2017 and was the perfect location for a winter wedding. 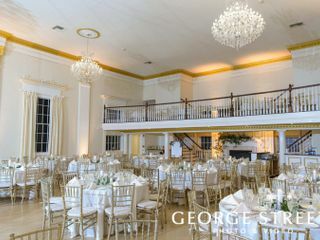 The venue itself, from the clean modernized downstairs (cocktail hour), to the gold trim, fireplaces, large windows and chandeliers that hang in the ballroom, is gorgeous no matter how you decorate it. It is a very classy, romantic and timeless looking venue. The Owners, Frank and Kristi and the wedding coordinator, Gianna, could not have been any more amazing to work with. They deserve many thanks for making all of my wedding dreams come to life. Gianna was the perfect wedding coordinator and made sure my husband, myself and all of our guests were well taken care of. Their staff, on all levels, always stayed so professional and they all made you feel like a part of their family. The food is unbelievable and guests our still raving about it. Their filet and pizza is a must! Love Love Love The Commons 1854, it exceeded all of my expectations. I truly cannot describe in words just how pleased I am that my husband and I chose The Commons 1854 as our wedding venue. As soon as we walked through the front doors while taking a tour on our venue search, we knew we found the perfect location for our big day. From the beginning, Kristi and staff made us feel so welcomed and excited. Any questions we had along the way were answered promptly and thoroughly. During our rehearsal we were informed that our coordinator was ill and would not be able to attend the wedding day. However, Kristi called in another coordinator, Maura, who had absolutely taken every vision we had, and executed every single detail flawlessly. For having met Maura for the first time just two days prior to our wedding day, she hit it out of the park, and that is an understatement! The staff at The Commons 1854 are so wonderful and really take into account your dream wedding and work so very hard to make that vision a reality. The food was exquisite! We have had so many of our friends and family rave about the food, service, and atmosphere. The Commons 1854 genuinely took our wedding, a day that already would've been the best day of our lives, and made it unbelievable and truly unforgettable. Joseph and I cannot thank you enough! I could not have chosen a better venue! My guests are still talking about how amazing everything was. My two most important things when deciding was food and a beautiful space and they far exceeded all my expectations. On top of the space and food being amazing my coordinator Gianna and every single staff member that worked my wedding went above and beyond. I felt Like a true princess bride who was catered to from the second I stepped Through their doors... along with all my guests! There is absolutely nothing I would change. Brides would be crazy for the commons to not be their #1 choice. If you want the best food, service and a beautiful ballroom the commons is the best choice. My day couldn’t have been anymore beautiful and went any more smoother then it did and at the end of the day that’s all a bride hopes for. So thankful with my choice at having my fairytale wedding at the commons 1854. I am the father of the bride. We were thrilled with this service. The facility was stunning, lovely and historic, the staff went beyond outstanding to make this wedding day extra special, with their amazing warmness and hospitality. They were ready to make rapid changes to everything and anything we requested at the ceremony and during the event, without hesitation. They celebrated with us, and truly made us think we were the ONLY event on their minds and hearts. Family members told me the next day how much they enjoyed the event. Most importantly, my daughter was thrilled beyond belief. Fathers can tell. We had an elder relative who passed out and needed hospital care. The staff was ready for this, made the emergency arrangements, and were very kind and warm to the relative until he was whisked away in the ambulance. The staff stayed as late as we needed, beyond the end of the event. 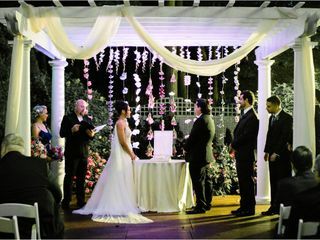 The wedding ceremony was held on the grounds in a beautiful garden complete with shrubs with side cover to enclose the area, and a beautiful canopy at the alter. During the rehearsal, they stayed well beyond it to be sure everyone felt good with the plans, answering every question (thanks to me, this went on for a while...). I would help arrange another family wedding at The Commons in a heartbeat ! Thank you so much for making my daughter's day so wonderful ! We had the most incredible experience at The Commons 1854!! The day was flawless thanks to the entire staff. Everything ran smoothly due to our coordinator Johanna's preparation, experience and attention to detail. Our entire guest list felt so welcome and cared for throughout the day. Our previous meetings with Frank, Kristi and Gianna left no questions unanswered and gave us peace of mind on the big day! The Commons was everything we wanted in a wedding venue and more! The beautiful space and the amazing staff gave us the wedding of our dreams (huge shout-out to Johanna for making every aspect of our wedding vision a reality). The food was incredible, the ballroom looked gorgeous, and the gardens look beautiful in our photos. A month and a half later, our guests are still talking about how impressed they were with The Commons and the food. The Commons staff was an absolute pleasure to work with for the whole planning process, the rehearsal, and the day-of event, and we can't thank them enough! When looking for a wedding venue I knew I wanted something with character and The Commons 1854 definitely delivered! Not only is it a classy and unique setting but every staff members associated with the space was an absolute pleasure to work with. They are incredibly responsive and would respond to emails within a minutes. 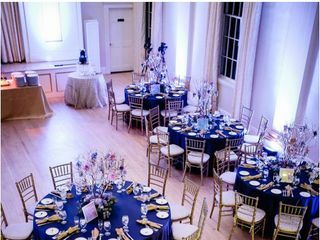 We had both our ceremony and reception at The Commons 1854 and it was amazing - the space itself is so beautiful and we received numerous compliments on the food. I cannot think of one negative thing that occurred during planning or on our big day! Colleen! Thank you so much for your kind words! It was a pleasure working with you throughout your planning process and serving you and your guests. All of your details were absolutely gorgeous and fit with the venue perfectly. We wish you both a lifetime of love and happiness and thank you for allowing us to host your special day. xo The Commons 1854.